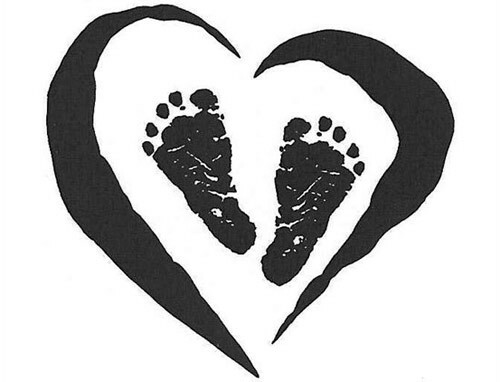 Footprint tattoos have been fast gaining popularity in the world of tattoo art, Footprint tattoos or tattoos with footprint motifs are often used to declare love for a child or a loved one. It is often accompanied by a name and a birth date. However, footprints also symbolize the right path of life that our ancestors and many good men have walked before us. 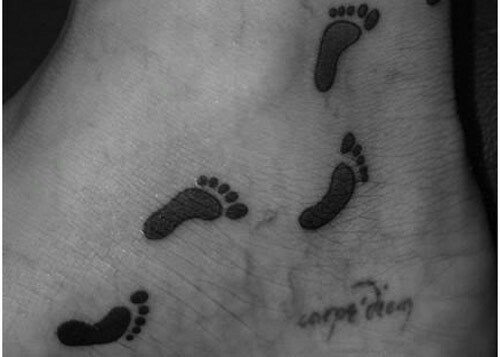 If you have long wished to have a footprint tattoo inscribed on to your skin to express your love for someone special or for spiritual inspiration, then this below mentioned list of the top ten footprint tattoos will help you define your own style statement. This tattoo apparently contains the birth records of certain individuals and is a pretty way of inscribing a date of emotional significance on your skin. Make a note of the beautiful ornate script. However, this is mostly an example of how you can use the footprint motif for a tattoo. You are free to experiment with different colors or change the script. 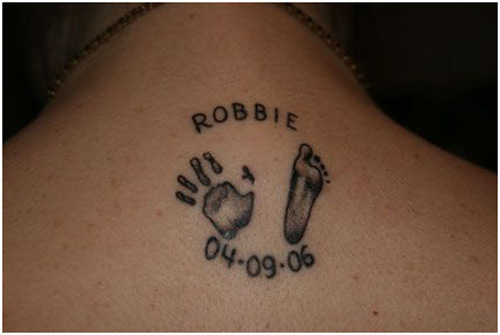 Take your love for your kids a step further with this cute and innovative tattoo. 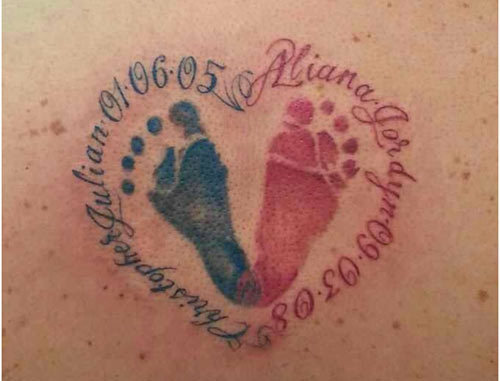 This footprint tattoo stands out for its execution and conceptualization. Look closer and see how the blurred footprint depiction contrasts perfectly with the bold black inscription. 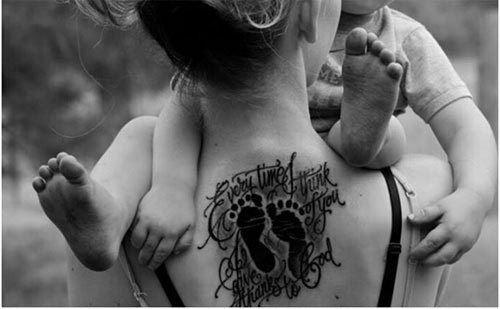 Yet another footprint tattoo to express the immense love for one’s child, this ornate footprint tattoo is a work of art that stands out for its conceptualization. Make a note of the charcoal black ink used, the clear footprints and the ornate font used to express a heartfelt message of pure love. For those of you with more than one child, this is a brilliant way to express your love for god’s blessings in the form of your children. These multiple footprints with the corresponding names could be perfectly placed on your upper back. Provided, you seek out the services of an expert tattoo artist so as not to mess up this brilliant piece of art. 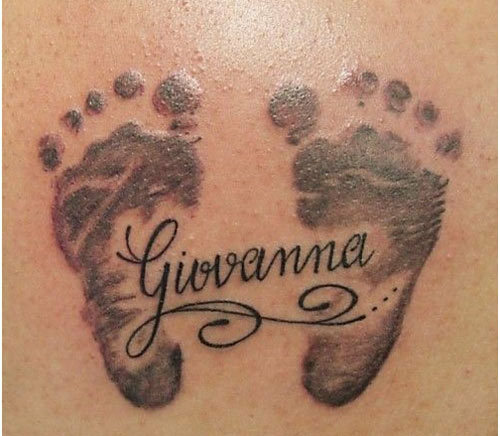 This footprint tattoo with its corresponding handprint is an effective way to inscribe a memorable occasion such as the birth of your child on your skin. 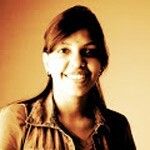 Make a note of the simple yet effective concept and execution, this idea is best replicated in its true form. This brilliant concept effectively amalgamates a butterfly and footprints together. This tattoo is mostly an example of how you could use this idea to create an abstract footprint tattoo using other colors or a different design concept. This brilliant design stands out for its artistry alone. Make a note of the intense shading work that creates the perfect illusion of a real foot impression. Difficult to replicate and best left as it is, you would have to put in some research to find the right tattoo art to replicate this piece of art. 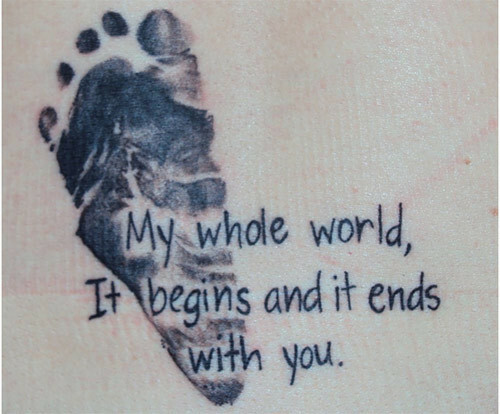 This footprint tattoo with an emotional message is a brilliant way of expressing your love for someone. However, this is mostly just an example of how you can use this concept to express your emotions, try a different message close to your heart with different fonts or colors if it suits you better. It’s only natural that our kids leave a lifelong impression on our hearts and this tattoo expresses that sentiment perfectly. Make a note of the bold black color used and the abstract heart formation. 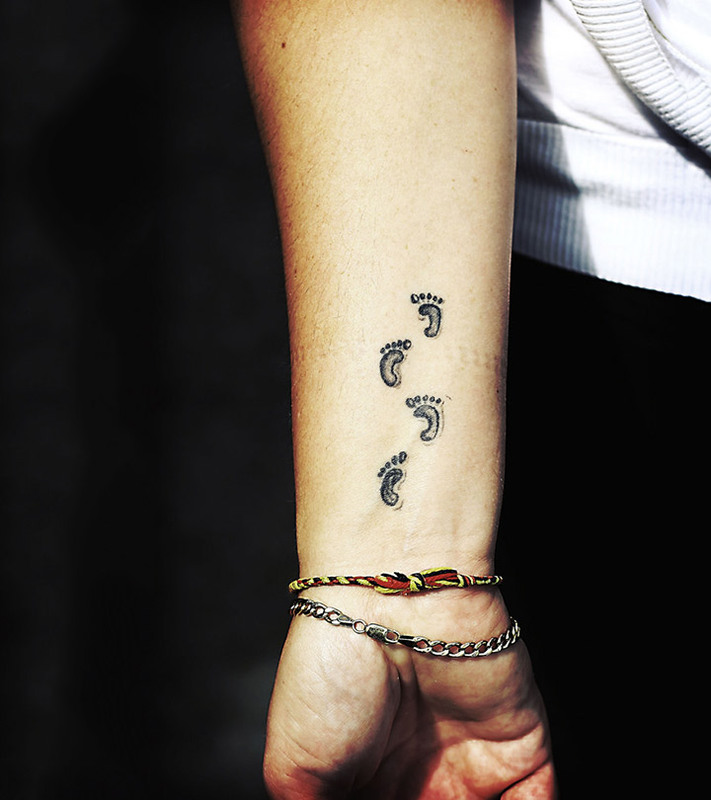 These footprints within a heart tattoo is one such tattoo which will stay very close to your heart. This miniature footprint tattoo stands out for its simple design concept and effective execution. 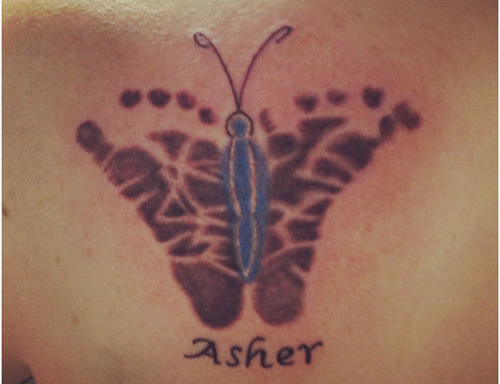 Easy to replicate however its essential to have an expert tattoo artist inscribe this on you. 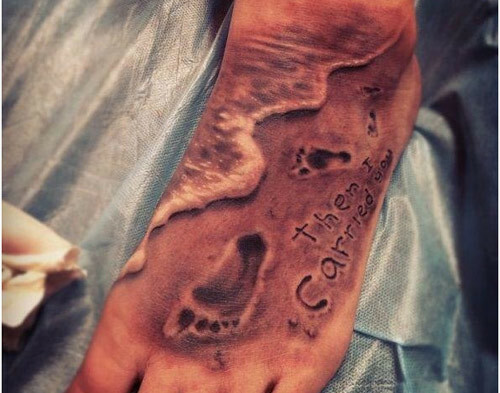 These top ten footprint tattoos are fabulous, aren’t they? Now you have to decide which tattoo you would like to have it inscribed on to your skin. Just don’t forget to tell us which one. Tattoos last for a lifetime, so get associated to a community and shape your tattoo design for proper influence.